Why Buy Bifold Windows and How Much Do They Cost? As one of the more recent designs, double glazed bifold windows offer some unique features that you may not have heard about. Here is a brief buyers guide to the advantages, disadvantages and costs of double glazed bifold windows. 1) What are Bifold windows & how do they work? You may have heard about Bifold patio doors before, Bifold windows are just an adaptation of this design. Unlike a regular Casement window, they don’t open outwards, but slide or “fold” to the side of the frames. The moving panels “stack” at the side of the main window frame and can sit to the inside or outside. The moving panels are mounted on rollers that fit into tracks for ease of use. Image RHS: Bifold windows – fitted to “stack” outside. Double Glazed Bifold windows are operated by a simple turn of the handle, which also operates the multi-point locking system. You can choose to have the panels fold to the left or right. An alternative is, as shown in the image above, where the windows open from the centre. 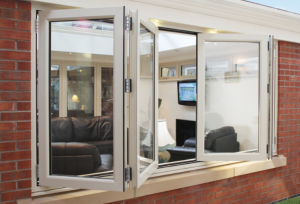 One of the main features of a Bifold window is that, when they are completely opened fully, they give almost a 100% clear opening allowing for uninterrupted view of the outside. For large openings they are perfect for giving you a proper picture window. Unlike a Casement window that opens outwards, the window handles are always within reach. You don’t have to stretch or lean right out to reach the handles when the window is wide open. This is really handy if you have Bifold windows fitted in a kitchen with a worktop just below them. They work very well inside the home to link living areas. Also they work very well as kind of “servery” window between kitchen and outdoor areas. Fit shelving or a worktop below them on the outside and you have a great place for alfresco dining. One thing to note, which could be seen as a disadvantage, is that if you choose to have the windows “stack” to the inside of the frame they will take up space inside the house. Internal stacking will also interfere with curtains or blinds. There are more moving parts in a Bifold window compared to a regular Casement window, so theoretically there is more to go wrong and the cost of repair could be higher. When it comes to prices, the disadvantage is that they cost more than a Casement window. However, they are less costly than Sash windows. As we briefly mentioned beforehand, if you want cheap double glazing, then a Bifold window is not the best option. They are costlier than your average Casement window design, simply due to the more complex construction. Double Glazed unit thickness (28mm to 12mm). Using Low-e glazing or Argon gas filled units. Material – UPVC, Aluminium or Timber. Colours – for UPVC & Aluminium. The best thing to do in order to find a good deal on the cost of double glazed windows is to have a selection of quotes from local & national installers and then compare prices.